“Drunk driving” does not always mean operating a car on the open road while intoxicated. Under Illinois law, a person may be found guilty of driving under the influence if he or she is in “actual physical control” of a vehicle, even if the car is parked and not moving. To illustrate, an Illinois appeals court recently upheld the conviction and eight-year prison sentence of a man who was found passed out behind the wheel of his parked car. The case arose from an April 2012 arrest in Chicago. A police officer, responding to an unrelated call, came across a parked car with the driver’s-side door open. The officer saw a man passed out behind the wheel. The officer observed the man had bloodshot eyes and his breath smelled of alcohol. The man subsequently failed a field sobriety test and declined a Breathalyzer test. The man had two prior convictions for driving under the influence. The case was tried without a jury. The trial judge found the defendant guilty of aggravated driving under the influence and driving with a suspended license, which is a felony in Illinois. Based on this and the prior DUI convictions, the judge sentenced the defendant to eight years in prison. In a decision issued years later, the Appellate Court of Illinois affirmed the judge’s verdict and sentence. The defendant argued that the government failed to prove he was in “actual physical control” of his car because he was passed out and the car itself was parked at the time the officer came upon the scene. 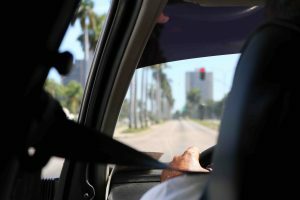 The appeals court explained that in Illinois, a person need not be driving to be in “actual physical control” of a vehicle. Rather, the court may look at a number of factors. In this case, the defendant was found in the driver’s seat and had the keys to the car in his right hand. Although he was unconscious when the officer discovered him, the driver was still in “actual physical control” as far as the law is concerned. The defendant also argued that the state failed to prove he was actually under the influence of alcohol at the time of his arrest. The trial and appeals courts rejected this defense. The appeals court noted that “circumstantial evidence alone may suffice to prove a defendant guilty of DUI.” Here, the court credited the arresting officer’s observations regarding the defendant’s bloodshot eyes and breath. The defendant’s refusal to take a Breathalyzer also showed “consciousness of his guilt,” according to the appeals court. Cases like this highlight the importance of working with an experienced Illinois criminal defense attorney. If you or someone you know is facing DUI charges, contact the experienced Illinois defense attorney David L. Freidberg right away at (312) 560-7100 or visit us online to request a consultation.